The Constitution of the United Arab Emirates was written on December 2, 1971. The day saw the rulers of the seven emirates stringing a thread through all the emirates to make it the united nation it is today. The United Arab Emirates (UAE), is a federation of - Abu Dhabi, Dubai, Sharjah, Ajman, Umm al-Qaiwain, Ras al-Khaimah and Fujairah. Thirty-eight years later, the nation takes a moment to reflect upon the hard work and perseverance that went into transforming the then arid land into the pride of the Middle East. The UAE flags that flutter high across the nation on this joyous day represent the peace, strength, courage and hope of the Emirati people. The Manipal Dubai Blog team pays its deepest respects to the United Arab Emirates, its leaders and its people on this glorious day. 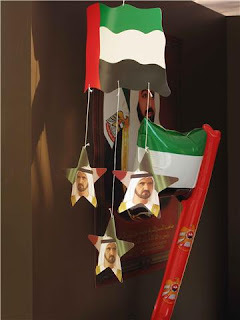 Here's wishing you all a Happy 38th UAE National Day!